UDM Downloads > LastBit Excel Password Recovery! Crack password-protected Excel spreadsheets in a few minutes! 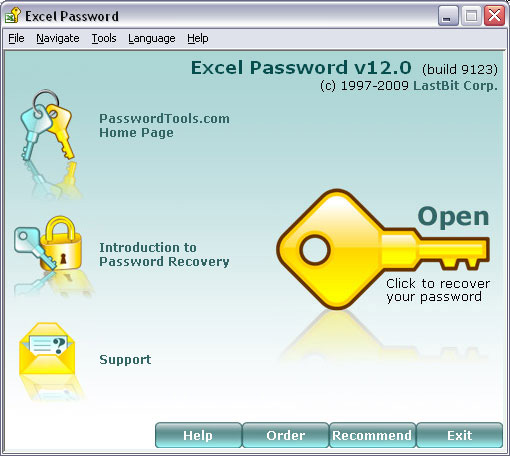 LastBit Excel Password Recovery cracks Excel 4.0-2007 passwords applying multiple attacks, providing a 100% satisfaction guarantee and returning your money back if it can't unprotect your Excel document in 36 hours (97% of all documents can be unlocked during the first minute). Distributed Password Recovery attacks allow recovering even the most complex passwords in the most secure Excel 2007 spreadsheets. No need to be a specialist in data security or a password hacker to use LastBit Excel Password Recovery. The innovative password recovery solution makes Excel recovery easy. There are many competitors on the market, but none so far are offering the unique combination of the ease of use, speed, reliability and the full satisfaction guarantee backed by the 100% Money Back policy. Attacks on passwords supplied with LastBit Excel Password Recovery include Instant Password Extraction to recover passwords to legacy versions of Excel, fast Dictionary Attack and slow Brute Force Attack. A combination of the latter two makes a new Smart Force Attack for faster recovery. If you know a part of a password, the extra Password Variation attack finds the password even sooner. Finally, the latest Express Recovery attack instantly unlocks most Excel spreadsheets no matter how long the password is. Dealing with both the legacy and the most recent versions of MS Excel, the Express Recovery feature can instantly unlock .xls passwords for Excel 97-2003. The advanced Express Recovery technology makes it easy to instantly unlock most Excel documents no matter how long and complex the passwords are. LastBit have been around since 1997, providing multiple password recovery tools to its customers. LastBit Excel Password Recovery is the only password recovery solution for Microsoft Excel to offer a 100% satisfaction guarantee.